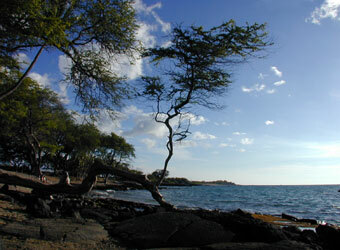 Hawaii's shorelines are varied. They may be sandy beaches (white, black or green), as you just learned about in a previous section on geology, as well as solid rock. Some of the rocky shorelines are gently sloping and have neat tidepools when the tide is low. Other rocky shorelines are steep cliffs with little access to the ocean from the shore. Hawaiian tidepool life is typical of rocky shores. 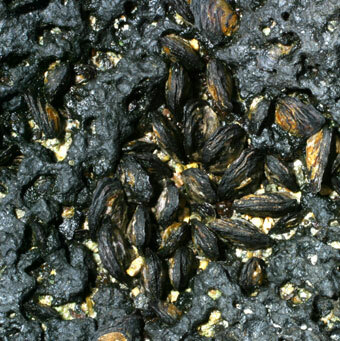 There are the usual high intertidal periwinkle snails, barnacles, and mussels. 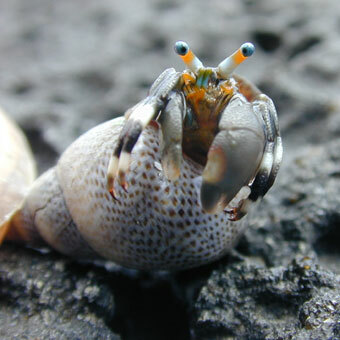 Hermit crabs and other creatures are also common and it is worth a trip to a rocky shore at low tide to spend some time viewing these intertidal creatures. Sometimes there are even little fish in the tidepools. Because Hawaii has so much sun, the intertidal life is more restricted than in temperate waters (like California) because it gets so hot at low tide. Subtidal coral reefs can also be found in Hawaii although Hawaii is considered to be close to the border for coral reefs (it is almost too far north but not quite). Hawaii is not as warm as many other areas that have well established coral reefs and much of the coral in Hawaii is living on the rocky substrate (lava) rather than being hundreds of feet thick as in the classic coral reefs. Hawaii's ocean waters are about 77 to 82 degrees Fahrenheit year round all the way to 70 feet deep. Many creatures abound in these tropical waters, like corals, urchins, snails, crabs, and fish. Several moray eel species are commonly seen in shallow water while snorkeling. They are not harmful unless provoked. Many tropical fish abound in and around the corals. The ocean water is warm and clear in Hawaii and snorkeling near the shorelines usually is easy and brings many beautiful tropical fish into view for the snorkeler. 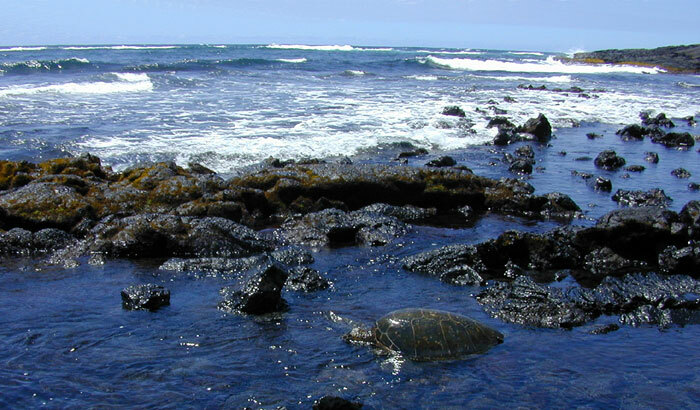 Marine turtles have been protected in Hawaii and the local people have tried to watch over the beaches where the Hawaiian turtles come to nest. Because of this the marine turtle population is thriving in Hawaii and it is a common occurrence to see a marine turtle while snorkeling or diving especially near the shore where they come to feed on algae. Moving just offshore a few pelagic vertebrates (mantas, whale sharks, dolphins and humpback whales) are Hawaiian attractions. 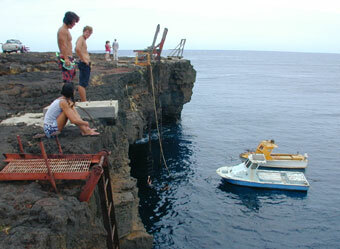 Large manta rays are another Hawaiian attraction. On the west side of Big Island, the locals have found that if strong lights are put into the ocean, in the evening, there is a concentration of plankton that comes to these lights. 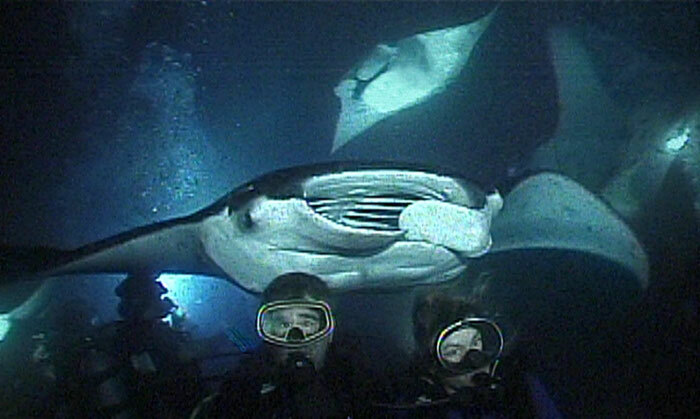 The large (some over 20 feet across) manta rays are plankton eaters and they are attracted to these light stations. It started at some of the tourist hotels where they would shine big lights into the water at night and the mantas would come in to eat the plankton and jump out of the water and amuse the tourists. Then the dive companies got the idea to put out their own lights and bring divers to view the mantas. Many divers can sit in a large circle around the underwater lights and watch the mantas for hours. If there is lots of plankton the mantas will swoop in with their mouths open near the bottom, go up the shaft of light, catching plankton, then do a belly roll and repeat this again and again. It is a spectacular sight if you are lucky enough to be there when the plankton is blooming, the water is calm, and the mantas are feeding. 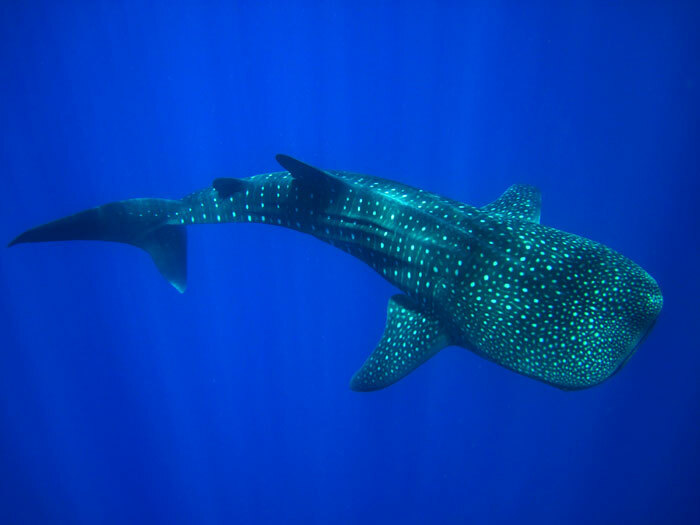 Whale Sharks are attracted to the plankton rich waters off the coast of Hawaii. They are not as common as the manta rays or the humpback whales but often show up close to shore and provide a wonderful experience for scuba divers and snorklers. The whale shark is the largest of all the sharks but is completely harmless to humans. It feeds entirely on plankton and often seems to be curious when encountering divers and seemingly enjoying the human/shark experinece. This image was of a young whale shark that spent over an hour with me and my dive buddies right outside of the harbor in Kona Hawaii - circling back to us again and again. Humpback whales are another of Hawaii's common visitors. Many North Pacific humpbacks go to Hawaii every winter to mate and to have their young. During the summer months they will usually leave for more productive polar waters to feed but during winter there are many humpbacks in Hawaii. Maui is known for its winter humpbacks but they are also common on Hawaii and the other islands. 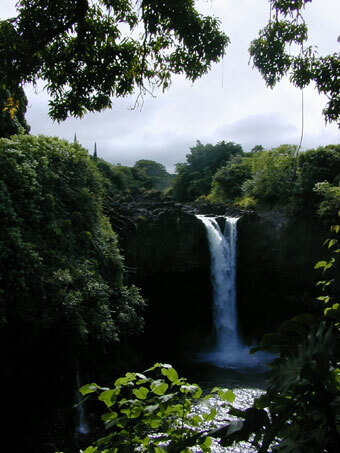 Waterfalls are common on the eastern sides of Hawaiian islands because as this moisture laden air from the Trade Winds hits the eastern side of the island it rises over the island. Rising air will cool and moisture will condense and fall. The eastern sides of the main Hawaiian Islands are always the wet side and often have lush vegetation and many waterfalls (left). As the air moves over the island, to the west side, it has lost its moisture so the western sides of the Hawaiian Islands are much dryer than the eastern sides. This effect on the western sides is called a rain shadow. 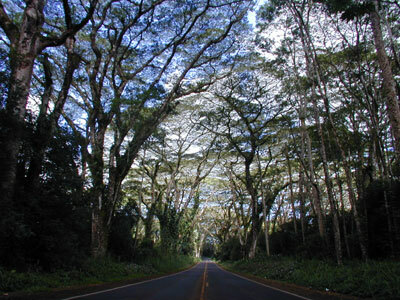 Tropical rain forests are often found on the wet sides (eastern) of Hawaiian Islands. 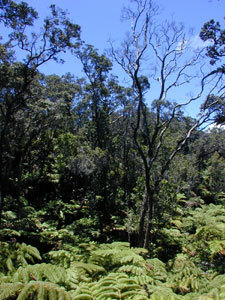 Ohia forests and fern forests are common in Hawaii, along with many other tropical plants. Ohia trees are a mainstay of Hawaiian forests however recently a disease, new to science, called 'Rapid Ohi'a Death', or ROD, a type of fungus, has been found on the Big Island. Steps are being taken to prevent its spread and protect this important Hawaiian tree. The wet side (east) is the area with the spectacular waterfalls that you see in many pictures of Hawaii. A rain shadow affects the western side (dry side) of the larger Hawaiian islands as well as some of the smaller Hawaiian islands. Lanai and Kahoolawe are two small islands to the west of the larger Maui island and Maui gets all the moisture from the Trades, leaving Lanai and Kahoolawe islands almost entirely as deserts. 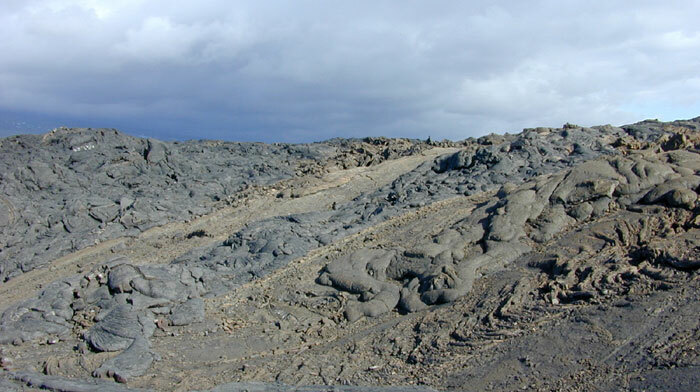 Lava deserts are often found on the dry sides (western) of Hawaiian Islands. 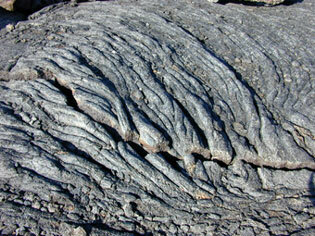 These lava deserts can be aa or pahoehoe lava or a combination of both types of lava. 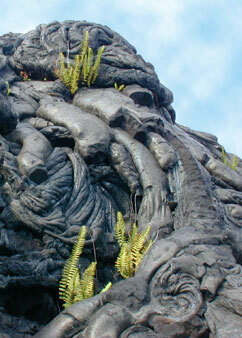 With little water there is little erosion of the lava to soil and little plant growth. 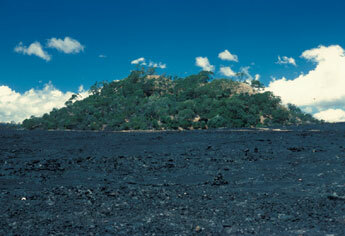 Lava deserts may also be found wherever there are new lava flows that have covered existing vegetation. 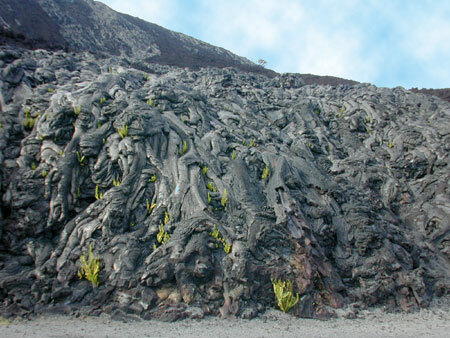 A kipuka is where lava flows surround an 'island' that retains its living vegetation. 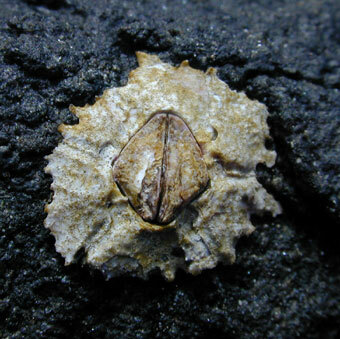 Often the organisms in a kipuka are cut off from much of the natural environment by the lava desert surrounding them. 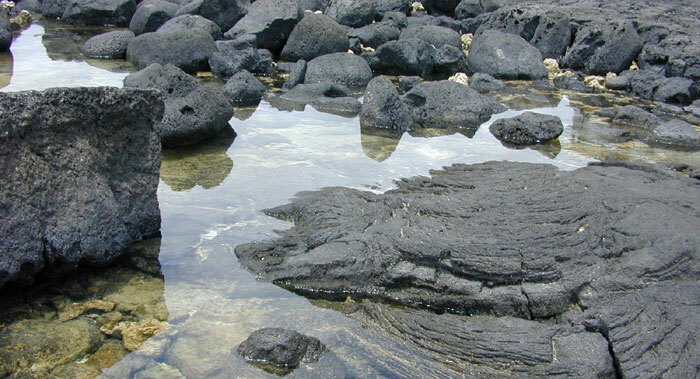 After the lava hardens it will eventually erode, forming soil. It may take a long time for this process in the absence of rain and streams so the western sides of many of the Hawaiian Islands generally have little vegetation. The ecological process of succession is the beginning of life forms living in new areas of Earth and the changes that occur with time as species come and go, competing for food and space. On the new lava beds, when there is enough erosion to produce some sediments, there will be a few plants at the beginning of succession. Over time other species may inhabit the area. This is much like what happens when new islands form … a process of succession until a stable community is formed. Stable communities are called 'climax communities' in ecology theory. They look similar year after year although species there grow up, reproduce and die but the general overall look does not change. Islands are known for having endemic species. Endemics are species that are found only in that particular area. Hawaii is known for having a large number of island endemics, as many as 6,000 species. Many of these species have become extinct. These extinctions are alarming, some resulting from misuse of the environment by humans but many are from the introduction of foreign species to the island ecosystems. The introduced species may outcompete the native species (and endemics) until they are extinct. Recent bird extinctions in North America include 8 species from the North American continents and 24 species from Hawaii. Near Haleakala Crater, on Maui, there is a population of Nene that was re-introduced, in 1962, into the wild from captive breeding. 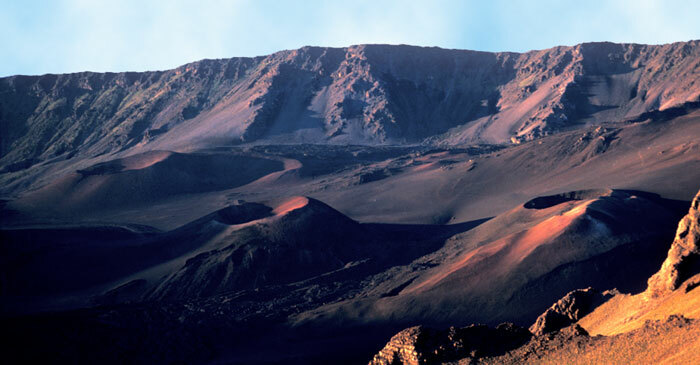 The only truly wild population is on the big island of Hawaii, on the slopes of the volcanos. 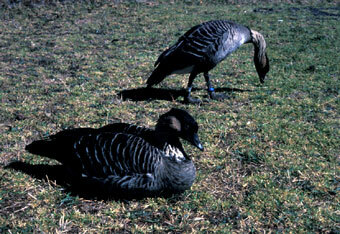 This species, Branta sandvicensis, is the state bird of Hawaii and may also be called the Hawaiian Goose. It used to be hunted until the mid 1950s when there was estimated to be only 30 birds left. From these 30 birds the population now numbers in the thousands due to careful protection, captive breeding and re-introduction to the wild. 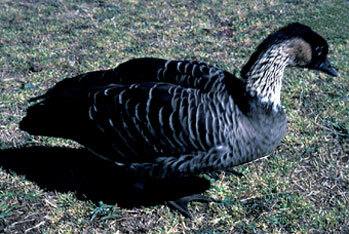 Nene feed on plants and generally do not need a water source. They are able to get all their water from the plants, probably a lot from berries. They breed in the winter with nests on the ground which makes them vulnerable to introduced predators in Hawaii like the mongoose, cat, and dog. 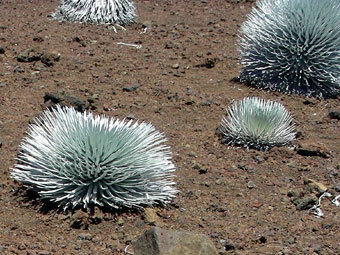 Silversword plants are endemic to Hawaii and are only found above 6,500 feet. This leaves their primary habitat to the tops of the Hawaiian volcanos. 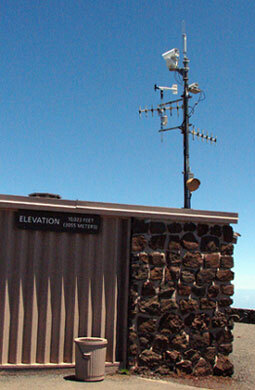 Haleakala National Park, on Maui, is one of the main areas where this plant is found. 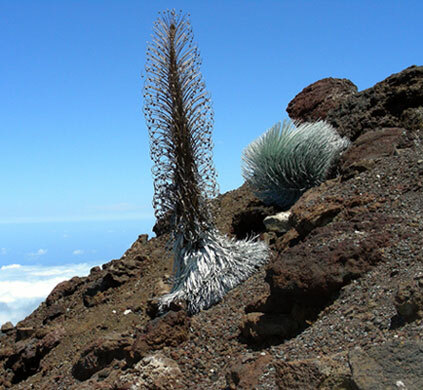 It was very abundant on Haleakala crater, in the past, but tourists used to take this plant as a souvenier because it meant they had been high up the crater. 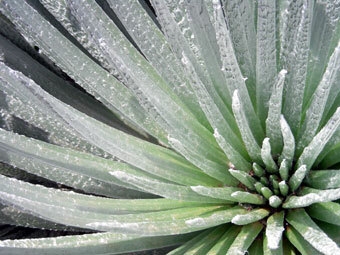 By 1920 this had reduced the silverswords of Haleakala to near extinction. It is protected as a 'threatened' species by law now and Haleakala National Park estimates there are currently over 50,000 plants in the park. Silverswords are in the sunflower family and flower only once in their life. After living for several years a healthy silversword plant will send up a 4-6 foot flower stalk. Its flowers bloom in the summer, are insect pollinated, and form seeds that are dispersed. Once the seeds are mature the plant dies (above right). Each year the number of adult silverswords that bloom (and then die) varies from zero to over 6,000 depending on the weather and health of the plants. Hawaiians call the silversword 'ahinahina'. The presence of plants of various sizes and ages is an indication that the population is healthy. 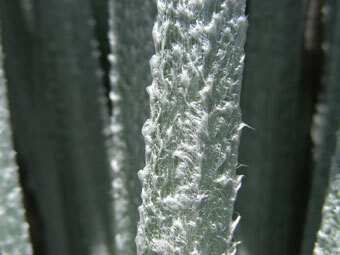 Silversword leaves are 'hairy', a protection from the wind and ultraviolet rays of the sun. The white 'hairs' give the plant a silver look. The species that lives on Haleakala, Maui is Argyoxiphium sandwicense and generally lives 30 to 40 years before it flowers. 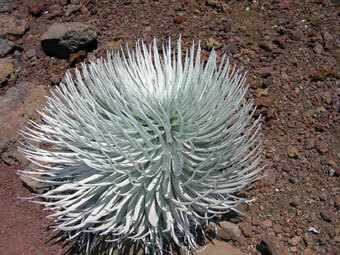 It is here, on Haleakala, that silverswords are easily seen. 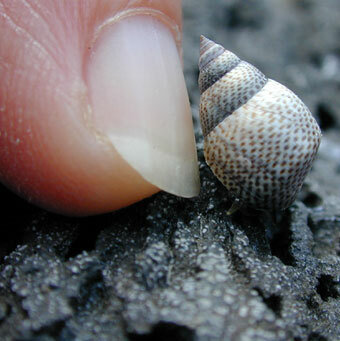 Other species do occur on other Hawaiian islands. The good news about Hawaiian ecology and endemics is that recent legislation and education is protecting many of the unique Hawaiian ecological habitats and species. Tourists are now more interested in taking home pictures instead of plant, animal or rock specimens.